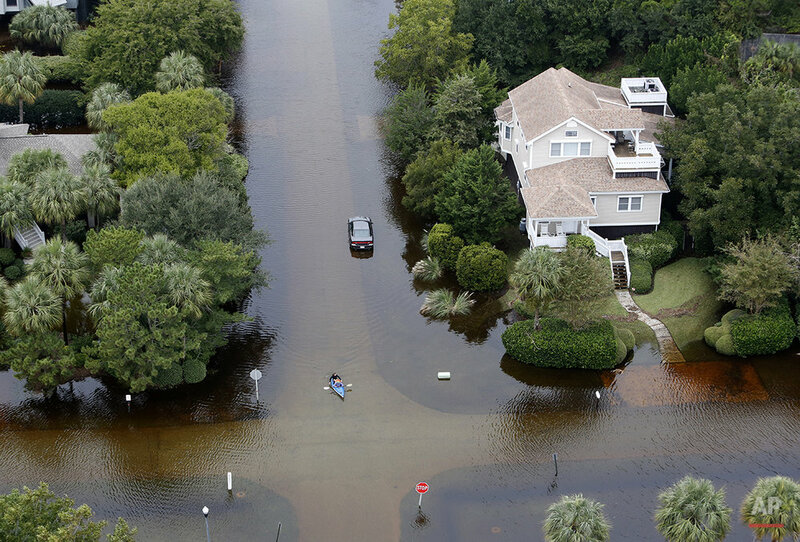 The Carolinas saw sunshine Tuesday after days of inundation, but it could take weeks to recover from being pummeled by a historic rainstorm that caused widespread flooding and 16 deaths. Tuesday was the first completely dry day in Columbia since Sept. 24, but officials warned that new evacuations could be ordered as the huge mass of water flows toward the sea, threatening dams and displacing residents along the way. "God smiled on South Carolina because the sun is out. That is a good sign, but ... we still have to be cautious," Gov. Nikki Haley said Tuesday after taking an aerial tour. "What I saw was disturbing." "We are going to be extremely careful. We are watching this minute by minute," she said. At least 14 weather-related deaths in South Carolina and two in North Carolina were blamed on the vast rainstorm. Six people drowned in their cars in Columbia alone, and several died after driving around safety barriers onto flooded roads. Haley implored her citizens to stop doing that. "Please help us help you," she said. "We want to make sure every bridge and road is safe for you and your families." Flooding is a concern wherever concrete covers soil that would otherwise act as a sponge in heavy rain. But the multitude of waterways in Columbia — where the Broad and Saluda rivers come together to form the Congaree — made the state capital a prime target. Water distribution remained a key problem Tuesday across much of the state. In Columbia, as many as 40,000 homes lacked drinking water, and the rest of the city's 375,000 customers were told to boil water before using it for drinking or cooking, an order that Mayor Steve Benjamin said will likely be in effect for "quite some time." "We still have some infrastructure issues. 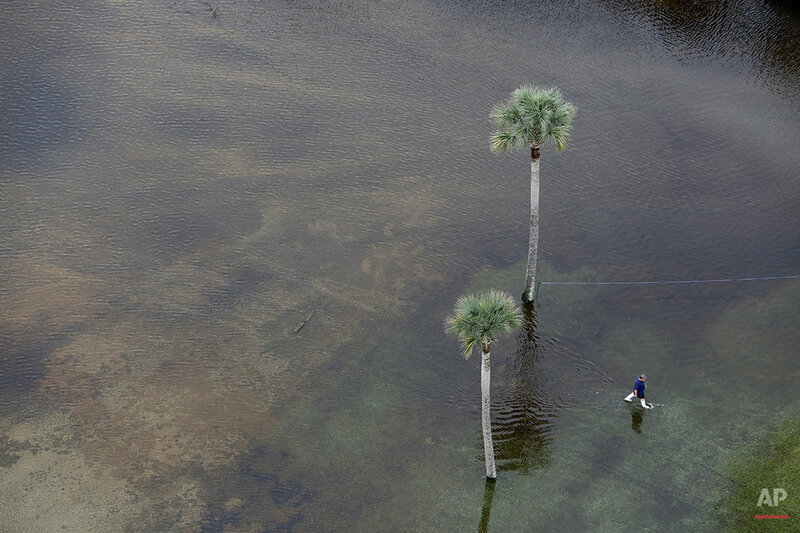 We still have water coming down from the Upstate," Benjamin said. Authorities made 175 water rescues, pulling people and animals to safety. Nearly 1,000 people were staying in 26 shelters that the governor said were fully stocked and comfortable. Some 200 engineers were checking roads and bridges, but nearly 500 of them remained closed Tuesday, including a 90-mile stretch of Interstate 95 between Interstates 20 and 26, the state Department of Transportation said. Nearly 30,000 customers were without electricity at the storm's peak, but the power grid is coming back on, the governor said. In Effingham, about 80 miles east of Columbia, the Lynches River was at nearly 20 feet on Tuesday, five feet above flood stage, the National Weather Service said. A day after evacuation orders went out, Kip Jones paddled a kayak to check on a home he rents out, and discovered that the family lost pretty much everything after seeking shelter elsewhere. The lower story had almost eight feet of water in its bathroom and bedrooms, he said. "Their stuff is floating all in the house," Jones said. "I don't know if the house will be salvageable. ... Once the water comes in the house you get bacteria and you get mold. I don't know if the water in the house is a total loss or a partial. I don't know what to expect. We'll find out soon though." Closer to the capital, another dam failure Monday rattled residents who thought the worst had passed after a weekend of hundreds of water rescues. James Shirer watched a dam fail Monday, emptying the 22-acre Rockyford Lake in the town of Forest Acres in less than 15 minutes. "It just poured out," Shirer said. The rains have "wrecked the dams; they've ruined all of the bridges." South Carolina's low-lying geography and insufficient spending on infrastructure left several town and cities like islands after roads washed out and creeks topped bridges. "I fear the worst is to come. We have a power substation under water. No telling when that thing gets fixed," Clarendon County Sheriff Randy Garrett said Monday in Manning, a community isolated by floods about 60 miles southeast of Columbia. 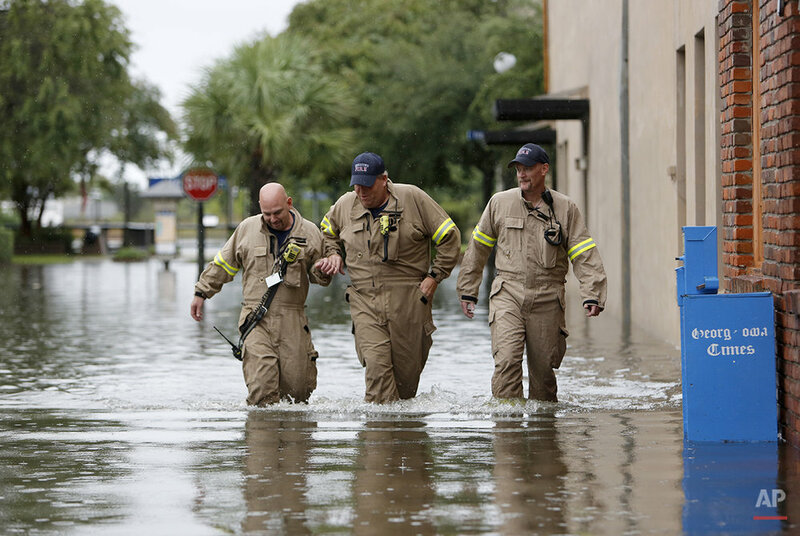 On Monday, officials brought bottled water and portable restrooms for 31,000 students at the University of South Carolina, and firefighters used trucks and pumps to ferry hundreds of thousands of gallons of water to Palmetto Health Baptist Hospital. Much-feared Hurricane Joaquin missed the East Coast, but fueled what experts at the National Oceanic and Atmospheric Administration called a "fire hose" of tropical moisture that aimed directly at the state. By Monday, the heaviest rains had moved into the mid-Atlantic states, but not before making history in South Carolina. The 16.6 inches of rain that fell at Gills Creek near downtown Columbia on Sunday made for one of the rainiest days recorded at a U.S. weather station in more than 16 years. "The fact is that we're getting six months' worth of rain in two days that's falling in an urbanized area," said John Shelton of the U.S. Geological Survey. "This was kind of the perfect storm." 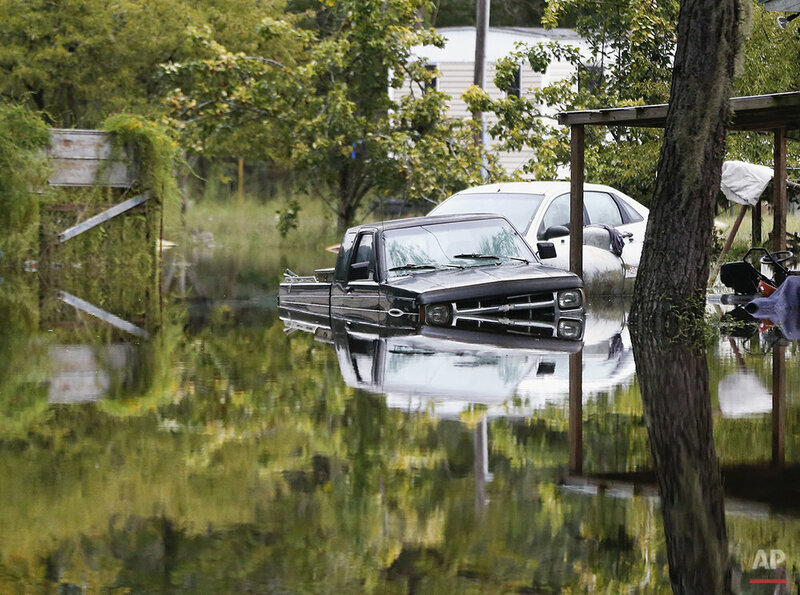 Text from AP news story, South Carolina Sees Sun, But Flooding Ordeal Far From Over, by Jeffery Collins and Emery P. Dalesio.